I feel a bit sorry that sour cherry season is nearly over in this neck of the woods. East of the Rockies, sour cherry season may already be long gone. I’m sad because sour cherries are my most prized fruit find and I’m sure that their scarcity is partly why I treasure them so. That, and I’ve got one heck of a sour tooth. This recipe comes from Tim at Lottie & Doof who adapted it from David Lebovitz, so you know it’s gotta be good. A couple weeks ago, I pitted close to 10 pounds of sour cherries but decided to use last year’s frozen stash for this recipe. It worked perfectly fine. I followed the recipe to a tee…except that I reduced the sugar from 3/4 cups to 1/2. The result was sweet and tangy and perfect. It tastes bright and summery and I’ll remember this recipe when I’m in the grips of winter and need a summer pick-me-up. 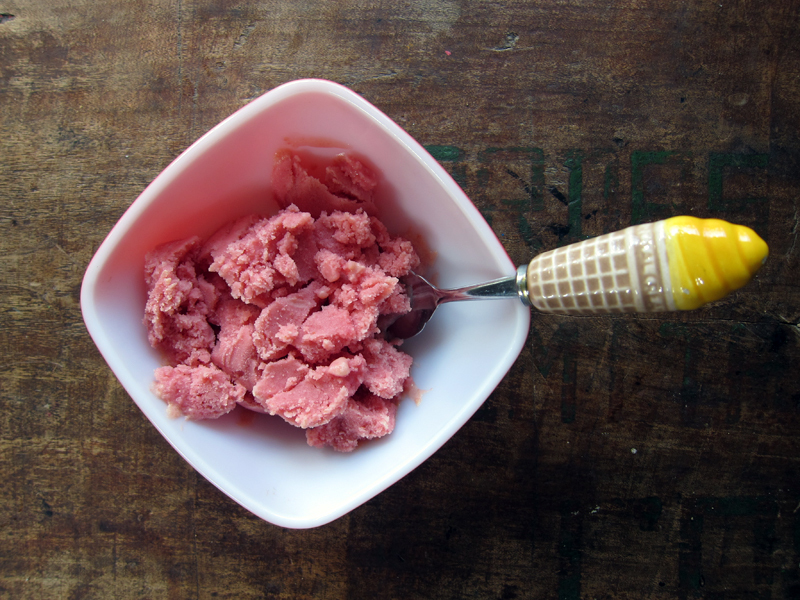 Like most homemade frozen yogurts, the texture is best the day it’s made: voluptuous and creamy. 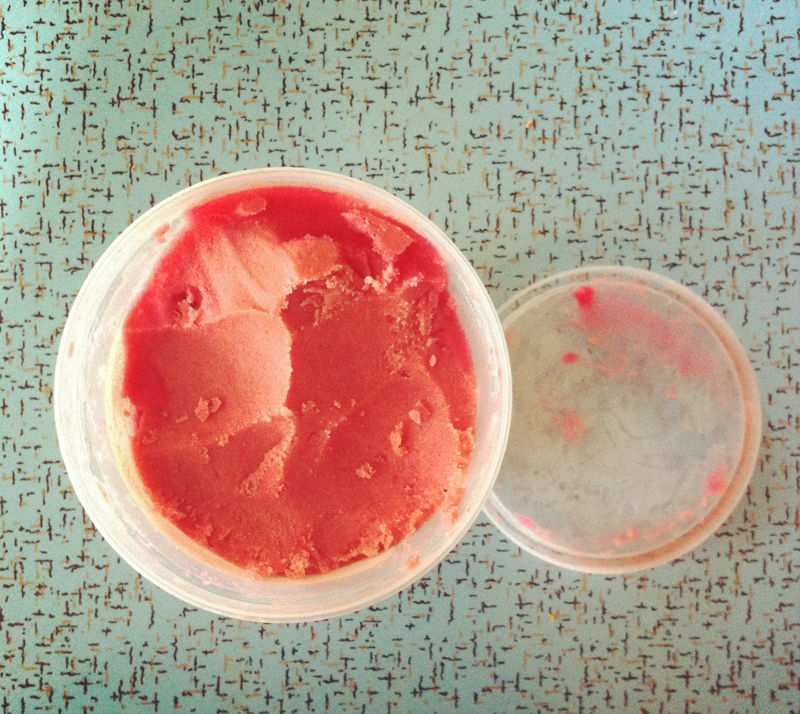 After a sit in the freezer, the texture becomes quite solid. Just let the yogurt sit out for a few minutes and run your ice cream scoop under the hot water faucet for a bit before digging in. 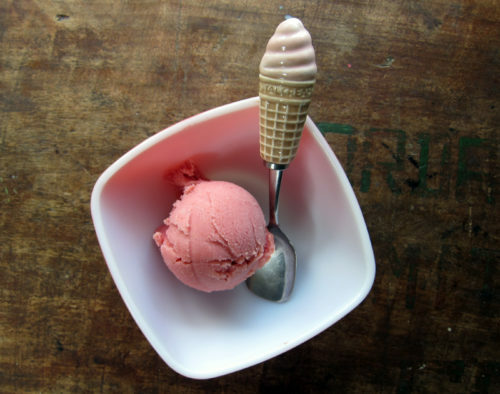 A well heated scoop will give a nice round ball of yum (see above). Or, you could just skip it and get something akin to crumbles. Cold, delicious, crumbles but not quite so pretty (see below). elsewhere: Go top your weekend bowl of ice cream with a delicious hot fudge peanut butter sauce.It’s vegan too! Head over to Poppytalk for the recipe. This recipe can be adapted to any fruit: sweet cherries, strawberries, peaches, blackberries (seeds strained & removed) would all work really well, though with strawberries and blackberries I’d try a squeeze of lemon or lime juice or vanilla instead of almond extract. Place cherries in a medium pot with the sugar. Cover and bring to a boil. Lower the heat and let simmer for 5 minutes, stirring frequently. Remove from heat and let cool to room temperature. 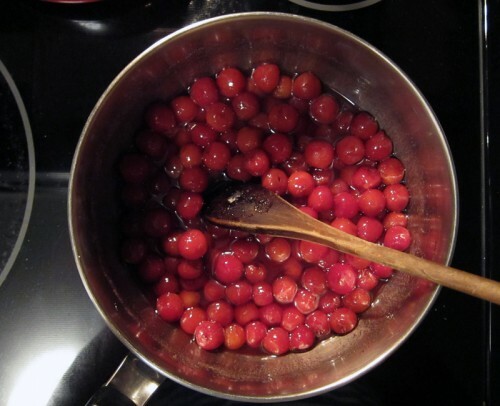 Puree the cherries and their liquid in a blender along with the yogurt and almond extract and process until smooth. 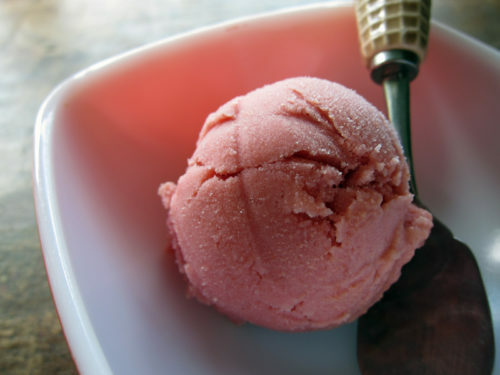 Chill for at least 2 hours or overnight, then freeze in your ice cream maker. 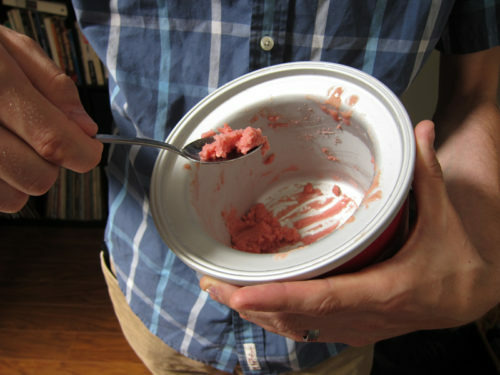 Serve immediately, or transfer to a lidded container and store in the freezer. I’m jealous that you can find sour cherries at all–they are few and far between in California! (Of course CA has other food that makes up for that shortcoming, but still.) This tart frozen yogurt sounds amazing! We have a sour cherry tree in our back yard and they grow “feral” all over the old parts of Bend. The girls and I picked ours and made tiny (mini muffin tin) pies for all our neighbors. The sour cherries I grew up with, and the ones on my tree here, don’t require pitting. If you pick them just right, you can squeeze the fruit away from the pit, which will stay on the stem connected to the tree! I thought that was the charm of “pie cherries” – they are less labor intensive; but no one I have talked to around here seems to know about this trick! Mrs. Camacho, feral sour cherries in Bend?! Clearly, I should move to Bend 🙂 And I love your picking/pitting trick, now I need to find myself my own tree. I wish I had a sour cherry tree, we had one growing up, and they taste so awesome in pie and cobblers and jam! You can buy these frozen and they are pretty good. I am making this!!! This looks wonderful! I’ve never made homemade frozen yogurt before, but I keep seeing awesome recipes popping up this summer. I’m definitely going to have to give it a try. I love tart frozen treats! sour cherry is such a summertime treat! Sour cherries are few and far between in these parts…in fact, I dont think I’ve ever seen any even though I’ve kept my eye out! This frozen yogurt looks delicious though and should I ever come across any, it will most certainly be made. Beautiful post… look forward to your posts as always. How do I prevent the frosting in the ice-cream? Just putting it in the blender will do? Piper, I used to be able to buy frozen sour cherries years ago here in Vancouver, but no longer. I’m glad you’re able to find them and they’d be perfect in this. Enjoy! Dixie, I’m sure you’d love this & you can try this froyo with other fruit too. Joanne, I know they were spotted at the big farmer’s market in June in NYC (Union Square market?) Good luck on the search! But do try this with other fruit – it should work beautifully. Sour cherries are my most prized fruit loot too, and if I don’t pick any this year it will break my heart! Your frozen yogurt looks just perfect. 2 c soy/almond/coconut milk, 3/4 c pb, 1/2 c brn sugar, 1 T vanilla, dash salt. Thanks Sues, it’s totally refreshing! Indeed, Lisa, the colour is gorgeous!! Elizabeth…..Oooh, thanks for the recipe for the ice cream! I’ve always wanted to make a pb one. Glad you enjoyed the sauce!!! I’m sure it was a great pair. That “round ball of yum” looks amazing! I have been so lazy this summer about making ice-cream at home. I just walk down the street to the corner shop and grab a Magnum ice-cream which tastes pretty good for store bought ice-cream but at a steep $4.50. Hey, ein tolles Portiönchen Eis. Es gibt nichts über eine Kugel selbstgemachtes Eis mit Sahne. Bijoux, I’ve been curious to try those Magnum bars – good to hear they’re yummy & too bad it’s so spendy too. Ooh yum. Ever since going to Wisconsin, I’ve been obsessed with sour cherries. Good tip about trolling craigslist for cherries–I have to try that!